The best part is that they are super easy to make and only require 4 ingredients! Enjoy! Slice the apples and spread out onto a baking sheet. Bake at 350F for 30 minutes. Once the apples are cooked, combine apples, dates and cinnamon in your blender or food processor and blend well. The mixture will have the consistency of thick apple sauce. Once the mixture is blended, stir in the coconut by hand. Form the mixture into small balls, rolling in the palm of your hand. The balls will feel a little mushy at this point, but will harden up once they are refrigerated. 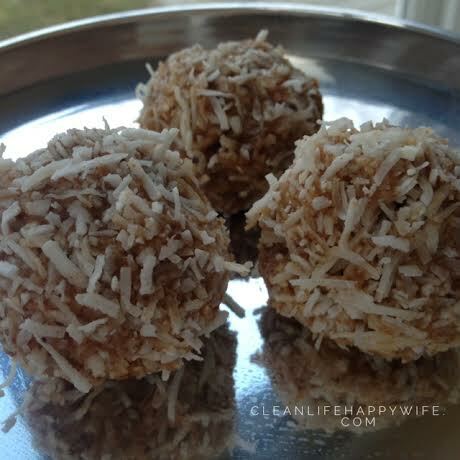 Set balls on a cookie sheet and refrigerate over night for best results, or for a minimum of one hour. ***TIP*** These can be a little tricky to roll out as they are quite mushy! If you are really struggling you can add a little more coconut. They will really harden up once they sit in the fridge for a while. This seems absolutely delicious! I can’t wait to try this!